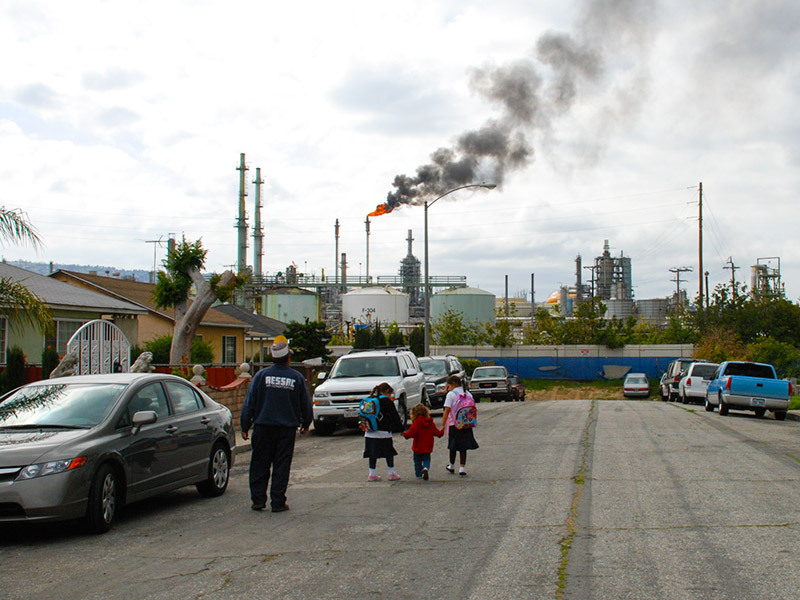 Refineries in Los Angeles’ Wilmington neighborhood. Photo by Chris Richard Photos CC 2.0. This post by Chris Richard  was originally published on Ensia.com , a magazine that highlights international environmental solutions in action, and is republished here as part of a content-sharing agreement. It was a time of year that should have been perfect. Warming temperatures marked Southern California’s gentle return to spring. The grass had shifted from drab to glowing green. The sky, which can be pale and hard in winter, had softened to a gentler blue. At the John Mendez Baseball Park in Los Angeles’ Wilmington neighborhood, the air rang with the sounds of batting practice. Nearby, people had brought their children to run on the green grass and play. Still, the day fell short of a Californian idyll. Over the outfield fence sat an oil rig. Not looming, exactly. It was just there, huge and pumping fumes — and this was just another moment, another swing of the pump, another gust of oil-sodden air. It was doing its job: moment by moment, day in, day out, year after year, a moment last year, a moment just now, doing its job. “I think about it every day,” says Esteban Esqueda, coach of the Cubs, a Shetland League baseball team for 5- and 6-year-olds. Wilmington is a blue-collar neighborhood adjoining the busiest seaport in the US and includes four refineries. It is dotted with oil wells and storage tanks, many right next to houses. “When I smell that smell, I think about the people who get sick,” Esqueda says. As California lawmakers move to make their state a national policy leader on atmospheric emissions and global climate change, environmental activists want that question answered closer to home. In September 2016, state governor Jerry Brown signed Senate Bill 32 , which requires the state to cut its greenhouse gas emissions to 40 percent below 1990 levels by 2030. The state already was on course to cut carbon emissions since the passage in 2006 of Assembly Bill 32 . That landmark legislation required the state to reduce its carbon emissions to 1990 levels by 2020. AB 32 fostered a host of new regulations and green policies, from California’s cap-and-trade  industrial carbon emissions law to rebates for solar power  installations and electric or fuel-cell car  purchases. Similarly, people like Esqueda and Sepulveda increasingly are asking how they fit in to California’s effort to turn back climate change. Up to now, some California environmentalists  have successfully argued that laws aimed at cutting greenhouse gases also benefit the state’s low‐income, largely minority communities by reducing respiratory disease in areas where air pollution is the worst. Historically, these Californians have supported tougher environmental rules. But while Esqueda and others still welcome the steps their home state has taken to reduce the pace of global warming, they want to see more environmental improvement, much more, in their own neighborhoods. And they want more programs to make it affordable for people in their communities to meet increasingly stringent greenhouse gas regulations. At the core of California’s efforts to reduce greenhouse gas emissions is the state’s cap-and-trade program. The “cap” is a statewide limit on greenhouse gas emissions from certain industries, which becomes stricter over time. In order to meet state restrictions, companies have three choices: reduce emissions, buy allowances  to continue releasing greenhouse gases or get “offsets ” that let them make up for high emissions in one area with reductions somewhere else. With that third option, though, there’s no state requirement that the environmental benefit be in California. A University of Southern California study  found that in the first two years after cap and trade began in early 2013, more than three-quarters of the offsets were for projects outside the state. Meanwhile, factories that bought the right to continue emitting greenhouse gases release proportionate amounts of “co-pollutants.” In fact, the study found that in the first years of cap and trade, emissions increased in communities surrounding industrial sites. Under California law, proceeds from allowance auctions must be used  for programs that reduce emissions of greenhouse gases. In 2012, state lawmakers passed Senate Bill 535 , which allocated a quarter of auction proceeds to subsidies for projects providing environmental benefits to “disadvantaged communities.” Last year’s Assembly Bill 1550  tightened that requirement, requiring that the 25 percent of auction funds be spent in those communities. The state identifies such areas with a computerized assessment tool  that evaluates environmental, health, demographic and socioeconomic data, census tract by census tract, across California. The money is supposed to go to environmental programs in the hardest-hit areas. But some have questioned the distribution. Garcia, chair of the Assembly Committee on Natural Resources, is a leader in the campaign by a new coalition of lawmakers from heavily polluted communities throughout California to expand subsidies more broadly in support of environmental justice. Late in April 2017, Garcia’s committee passed Assembly Bill 378 , which would formalize air pollution regulation as part of the state’s cap-and-trade program. It would require the state’s Air Resources Board to set factory-by-factory limits on air pollution. Increasingly, elected officials like de León and Garcia are citing that argument in discussions over SB 32. Governor Brown contends that continuing cap and trade is essential to that goal. Tax-limitation activists, meanwhile, say the program is unconstitutional because state legislators initially passed it with a simple majority vote, not the supermajority ordinarily required to impose a tax. But a state appeals court recently rejected that argument , saying cap and trade isn’t a tax at all because buying offsets or purchasing special pollution allowances is voluntary. Brown expects more challenges and is seeking a two-thirds ballot in the state legislature to approve an extension of the cap-and-trade program. That kind of supermajority is hard to attain. Legislators representing heavily polluted communities are using their votes as bargaining chips to promote programs that can benefit their constituents. “The state’s climate change laws have been called ‘trickle-down environmental policy,’” says state assemblyman Eduardo Garcia, who last year won the passage of legislation  that ties the state’s new greenhouse gas regulations to new oversight by state lawmakers and requires more emphasis on pollution around industrial installations, rather than simply seeking a statewide reduction in emissions. “Maybe before the environmental benefits did trickle down, but not far enough. We’re kind of turning trickle-down upside down so it benefits all Californians,” Eduardo Garcia says. Broadening participation in the state’s environmental programs is another way Californians are working to ensure environmental programs reach all people. In 2014 de León led passage of legislation  that directed state regulators to create programs increasing access to clean transportation in low-income communities. The law aims  to have 1.5 million electric or hydrogen-powered vehicles on the road by 2025 . “If we’re going to make a real dent in carbon emissions, which [are] global, we have to make sure that working families can find these cars to be affordable,” de León says. The law is at work in a pilot program  offered by the Richmond, California–based Community Housing Development Corporation (CHDC) that extends financing for used hybrid, electric or fuel cell vehicles to low-income residents of six Northern California counties. CHDC program manager Vivian Rahwanji is working on expanding the service throughout the state. Similarly, the environmental nonprofit Valley Clean Air Now  uses cap-and-trade money to fund a car trade-in program for low-income residents of the San Joaquin Valley. Executive director Tom Knox says he regularly helps clients exchange old internal-combustion vehicles that are expensive to maintain with much newer and more reliable used electric cars. Knox says he could easily see similar exchanges operating nationwide. “We’re not dealing with Santa Monica coastal types here,” he says, referring to one liberal section of the state. The culture and economy of the San Joaquin Valley are much more comparable to, say, Kansas or other more conservative parts of the country than to liberal enclaves, he says. In Los Angeles, Bahram Fazeli, policy and research director at the nonprofit activist group Communities for a Better Environment , wants to see such programs dramatically expanded. Amy Vanderwarker, co-director of the activist group California Environmental Justice Alliance , wants to take that transformational message to a broader audience. “What we’re really hoping, especially in the context of the federal administration, is to show that what climate leadership looks like today, in California and across the country, is policy that puts environmental justice and equity issues at the center. That’s how California can continue to lead,” she says. Aiko Schaefer, coordinator of Washington state–based Front and Centered , a coalition of environmental and economic justice groups, says California’s example inspired her own group’s support for carbon tax legislation  that includes direct financial support for neighborhoods most demonstrably hurt by pollution. “This idea of reinvesting carbon revenues into communities that have higher rates of pollution that was modeled in California is something we’re seeing find its way into state policies across the country,” Schaefer says. Rafe Anderson, who lives next door to Wilmington in San Pedro, attended a recent climate march  near an oil refinery that has announced plans to expand. He says it seems only reasonable to make the company deal with the pollution it creates. A few blocks away, near the Wilmington baseball park where the oil rig looms, Sandra Sepulveda smelled the air. It was a Saturday, and for now the cargo trucks that usually back up on Harry Bridges Boulevard had thinned out for the weekend. There was no traffic jam that day. You couldn’t smell the diesel fumes. A brisk wind had blown away the stench from the well. You could smell the ocean. It smelled pretty good. Proponents of the new blend of green policies and social justice hope for environmental reprieve that is permanent and that transforms their communities, much more than a breath of fresh air that depends on a shift in the wind. Chris Richard  is a Los Angeles-based freelance journalist. He writes about criminal justice, health and the environment. His work has appeared in The California Report, The California Health Report, Grist and The Christian Science Monitor.